Protection against malaria in humans can be achieved by repeated exposure to infected mosquito bites during prophylactic chloroquine treatment (chemoprophylaxis and sporozoites (CPS)). We established a new mouse model of CPS immunization to investigate the stage and strain-specificity of malaria immunity. Immunization with Plasmodium chabaudi by mosquito bite under chloroquine cover does not generate pre-erythrocytic immunity, which is acquired only after immunization with high sporozoite doses. Instead, CPS immunization by bite elicits long-lived protection against blood-stage parasites. Blood-stage immunity is effective against a virulent, genetically distinct strain of P. chabaudi. Importantly, if exposure to blood-stage parasitemia is extended, blood-stage parasites induce cross-stage immunity targeting pre-erythrocytic stages. We therefore show that CPS immunization can induce robust, long-lived heterologous blood-stage immunity, in addition to protection against pre-erythrocytic parasites following high dose sporozoite immunization. Cross-stage immunity elicited by blood-stage parasites may further enhance efficacy of this immunization regimen. Malaria is a life-threatening infectious disease in humans that is caused by a single-celled parasite called Plasmodium. The parasite is carried between people by mosquitos; when an infected mosquito bites a human, the parasite is injected into the bloodstream with the mosquito's saliva. Plasmodium first infects liver cells but then re-enters the bloodstream, where it infects red blood cells leading to symptoms of disease. If another mosquito bites the infected individual at this so-called ‘blood-stage’, the parasite can be passed to this mosquito and the cycle of transmission continues. Currently there are no vaccines available that can effectively protect against malaria. Although an experimental vaccine containing a weakened form of the parasite can protect against the liver-stage parasites, it fails to prevent the parasite from multiplying in the red blood cells. Therefore, the individuals remain susceptible to severe malaria. Recently, researchers have developed a new strategy for immunization that provides exposure to both liver-stage and blood-stage parasites. Human volunteers taking an anti-malarial drug were deliberately exposed to mosquitos carrying the parasite on three separate occasions. Although the volunteers were infected with the parasite, the anti-malarial drug killed the parasites inside the red blood cells. After the end of the drug treatment, the volunteers were exposed to mosquitos carrying the parasite and they were still protected from infection. These results are promising, but it is not clear if the volunteers have acquired immunity to liver-stage or blood-stage parasites, or even both. To answer this important question, Nahrendorf et al. developed a similar immunization strategy in mice. Just like the human volunteers, the mice were treated with an anti-malarial drug and exposed to mosquitos carrying Plasmodium on three separate occasions. Although the immunizations did not protect the mice against early infection in the liver, they did provide long-term protection against parasites multiplying in the red-blood cells. The immunity generated by this immunization strategy also protected the mice against another strain of Plasmodium, different to the one used in the immunizations. The experiments also show that prolonged exposure to the blood-stage parasites can even lead to immunity against the liver-stage parasites. Nahrendorf et al. 's findings show that this immunization strategy can protect individuals against both the liver-stage and blood-stage parasites. The next challenges are to find out how the immunity generated by one stage of infection can protect against the other stages, and to discover which molecules on the parasite the immune system targets. Protective immunity against microorganisms is developed after repeated infection and recovery (Mutapi et al., 2013). Vaccines are usually successful if they mimic these naturally acquired immune responses (Fox, 1984; Mielcarek et al., 2006). While protection against viruses and bacteria can be induced by vaccination with killed (inactivated) or live-attenuated pathogens (Delany et al., 2014), there is no licensed vaccine for human parasitic diseases like malaria that pose a major global health burden. The apicomplexan malaria parasite Plasmodium is transmitted by bites of female anopheline mosquitoes. In the vertebrate host, sporozoites injected into the dermis migrate to the liver, where they establish a clinically silent infection of hepatocytes. Merozoites are then released from the liver and invade erythrocytes, leading to an exponential asexual replication cycle that is entirely responsible for the clinical signs and symptoms associated with malaria. Immunity against severe disease can be acquired following repeated infection, but sterile parasite clearance is rarely achieved (Goncalves et al., 2014). Clinically immune adults in endemic areas still harbor parasites in their blood-stream (Okell et al., 2009). These asymptomatic carriers also develop gametocytes, the form transmissible to mosquitoes, thereby allowing the parasite to complete its life cycle. To achieve malaria control and eventually eradication, transmission must be blocked (Kappe et al., 2010). A vaccine that protects against pre-erythrocytic parasites, and thus outperforms naturally acquired immunity, would greatly facilitate this aim. Parasites that arrest during the liver stage, either because of irradiation (Nussenzweig et al., 1967) or targeted gene deletion (Mueller et al., 2005), can provide immunity against challenge infection. Indeed, immunization of human volunteers with irradiated sporozoites can induce sterile protection in experimental settings (Clyde et al., 1973; Seder et al., 2013). However, in the absence of acquired immunity to the blood-stage parasite a pre-erythrocytic vaccine that is only partially effective, and therefore permits breakthrough erythrocytic infections, will provide no protection against severe malaria (Bejon et al., 2011). The inclusion of a blood-stage component together with an effective pre-erythrocytic vaccine is therefore preferred to provide a multi-stage malaria vaccine that minimizes both transmission and disease (Ellis et al., 2010; Goodman and Draper, 2010). A recently described experimental malaria immunization protocol using chemoprophylaxis and sporozoites (CPS) (Roestenberg et al., 2009) ensures exposure to pre-erythrocytic and blood-stage parasites, and hence has the unique potential to induce protection against all Plasmodium life cycle stages in the vertebrate host. Three immunizations with bites of 10–15 Plasmodium falciparum-infected mosquitoes under chloroquine chemoprophylaxis are sufficient to elicit sterile protection against homologous challenge in human volunteers (Roestenberg et al., 2009; Bijker et al., 2013, 2014). Although it is not possible to measure liver parasite burden in human volunteers directly, it appears that immunity exclusively targets pre-erythrocytic parasite life cycle stages, as there is no protection against direct blood challenge (Bijker et al., 2013). CPS immunization is thus substantially more effective than immunization with irradiated sporozoites, which requires 1000 mosquito bites (Clyde et al., 1973) or five intravenous (iv) injections of more than 100,000 sporozoites for sterile protection (Seder et al., 2013). We therefore hypothesize that transient blood-stage parasitemia, before abrogation by chloroquine, may contribute to immunity following CPS immunization. In this study, we have investigated the stage- and strain-specificity of protection in a novel mouse model of CPS immunization using Plasmodium chabaudi. P. chabaudi establishes a chronic, non-lethal blood-stage infection, which has been used extensively to characterize the immune response to blood-stage parasites in vivo (Stephens et al., 2012). A recently optimized protocol for P. chabaudi mosquito transmission (Spence et al., 2012) allows us now to also study pre-erythrocytic stages of this rodent parasite. Heterologous protection can readily be assessed since many genetically distinct P. chabaudi isolates displaying a variety of virulence phenotypes are available (Mackinnon and Read, 1999; Otto et al., 2014). We immunized C57BL/6 mice three times with bites of P. chabaudi-infected mosquitoes under oral chloroquine chemoprophylaxis similar to human clinical trials (Roestenberg et al., 2009; Bijker et al., 2013, 2014). This approach is unique amongst all published animal models of CPS immunization (Beaudoin et al., 1977; Golenser et al., 1977; Orjih et al., 1982; Belnoue et al., 2004; Friesen and Matuschewski, 2011; Inoue et al., 2012; Nganou-Makamdop et al., 2012b; Doll et al., 2014; Lewis et al., 2014; Peng et al., 2014), which have (without exception) used iv injection of high numbers of Plasmodium berghei or Plasmodium yoelii sporozoites for immunization. Furthermore, rather than evaluating effector mechanisms by challenging shortly after immunization (Beaudoin et al., 1977; Belnoue et al., 2004; Friesen and Matuschewski, 2011), we performed the challenge 100 days after the final immunization to test the generation and maintenance of long-term immunological memory. CPS immunization with P. chabaudi by mosquito bite does not generate pre-erythrocytic immunity, which is acquired only after immunization with high doses of sporozoites. Instead, immunization by bite elicits blood-stage immunity that is effective against the immunizing strain and also a more virulent, genetically distinct P. chabaudi. Moreover, extended exposure to blood-stage parasitemia elicits robust pre-erythrocytic immunity, comparable to protection afforded by high dose sporozoite immunization. Exposure to blood-stage parasites thus elicits heterologous blood-stage immunity and can contribute to the pre-erythrocytic efficacy of this immunization regimen. Therefore, these findings add significantly to advances from previous CPS immunization mouse models by evaluating the generation of immune memory after immunization with P. chabaudi by mosquito bite. This is relevant for our understanding of acquired immunity in a malaria endemic setting, and can inform multi-stage malaria vaccine development. We investigated the stage- and strain-specificity of protection in a novel mouse model of CPS immunization (Figure 1). C57BL/6 mice were immunized three times at 2-week intervals with P. chabaudi AS-infected mosquito bites. For certain experimental questions, it was necessary to deviate from the natural route of infection and inject sporozoites iv to control the dose. Starting on the day of infection, mice were then treated orally with 100 mg per kg chloroquine for 10 days following each immunization. To assess the long-term efficacy of acquired immunity, mice were challenged approximately 100 days after the last immunization. Protection against pre-erythrocytic or blood-stage parasites was evaluated after mosquito bite or direct blood challenge. To quantify transient blood-stage exposure during chemoprophylaxis and sporozoite (CPS) immunization female C57BL/6 were immunized three times at 2-week intervals with P. chabaudi AS-infected mosquito bites (typically 9.15 [median, range 6.9–13.6] [Spence et al., 2012]). Following each immunization mice received 100 mg per kg chloroquine (CQ) per os daily for 10 days, starting from the day of infection. A small blood sample was taken 48 hr after each mosquito transmission (before merozoite egress from the liver, P. chabaudi develops in the liver for 52 hr [Stephens et al., 2012]; erythrocytic cycle 0), and then every 24 hr until erythrocytic replication cycle 4. Blood parasitemia was analyzed by sensitive quantitative RealTime (qRT) PCR (Figure 2). Pre-erythrocytic immunity was evaluated in mice immunized three times with either P. chabaudi AS-infected mosquito bites (Figure 3A) or by intravenous (iv) injection of defined numbers of P. chabaudi CB sporozoites (Figure 3B). P. chabaudi CB was used since mosquitoes infected with this parasite harbor an increased number of sporozoites in their salivary glands (Spence et al., 2012), which made injections of high numbers of sporozoites technically feasible. Mice were challenged 100 days after the last immunization by mosquitoes infected with the respective homologous strain. Liver parasitemia was examined 42 hr after challenge by qRT PCR. Blood-stage immunity was assessed in mice immunized with P. chabaudi AS-infected mosquito bites by qRT PCR and thin blood film following homologous challenge with either infected mosquito bites (Figures 4A, 5C/D) or intraperitoneal (ip) injection of parasitized erythrocytes, which were either derived from a donor mouse infected by mosquito bite (recently mosquito transmitted, Figure 4B) or after 26–32 serial blood-passages (Figure 4C). Heterologous protection was assessed using P. chabaudi CB-infected mosquito bites (Figure 5A/B). To evaluate cross-stage protection mice received a first infection with P. chabaudi AS either by mosquito bite or by ip injection of recently mosquito transmitted parasitized erythrocytes. The resulting blood-stage infection was eventually self-cured without intervention. 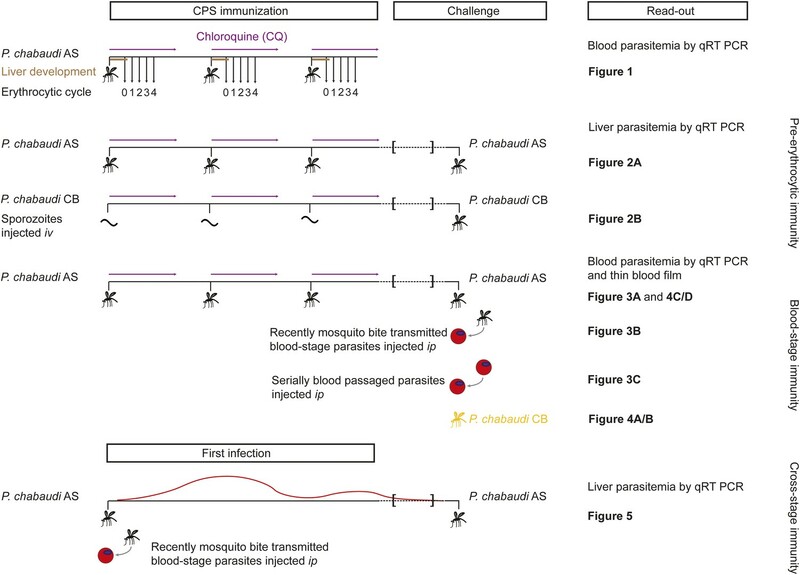 Mice were re-challenged 100 days after their first infection with P. chabaudi AS-infected mosquito bites and liver parasitemia was evaluated by qRT PCR (Figure 6). Transient blood-stage parasitemia is a key feature of CPS immunization. We used quantitative RealTime (qRT) PCR to measure erythrocytic parasite burden after each immunization with P. chabaudi AS-infected mosquito bites under chloroquine cover. After the first immunization, approximately 50,000 parasites per ml whole blood were detected within the first erythrocytic cycle (Figure 2). The amount of blood-stage parasites within the first erythrocytic cycle varied extensively (median 47,596, range 67–222,699), reflecting the stochastic inoculation of sporozoites during mosquito bite (Beier et al., 1991; Ponnudurai et al., 1991; Medica and Sinnis, 2005). Thereafter, chloroquine reduced parasitemia by 86–96% every 24 hr. After the fourth cycle, the majority of erythrocytic parasites were cleared. Similarly, after the second and third immunization mice experienced a substantial number of circulating blood-stage parasites for 48–72 hr. However, although blood-stage parasites were detected in all but one mouse, parasitemia in the first erythrocytic cycle was reduced by 5- and 13-fold after the second and third immunizations, respectively, when compared to infection controls (Figure 2). Consequently, one CPS immunization is sufficient to reduce blood-stage parasite burden within the first erythrocytic cycle, which indicates either pre-erythrocytic or blood-stage immunity. Chloroquine permits transient blood-stage parasitemia during each immunization. The number of parasitized erythrocytes (pE) per ml of whole blood was enumerated by quantitative RealTime PCR after each CPS immunization (i1, i2, i3) with P. chabaudi AS-infected mosquito bites under chloroquine (CQ) cover. 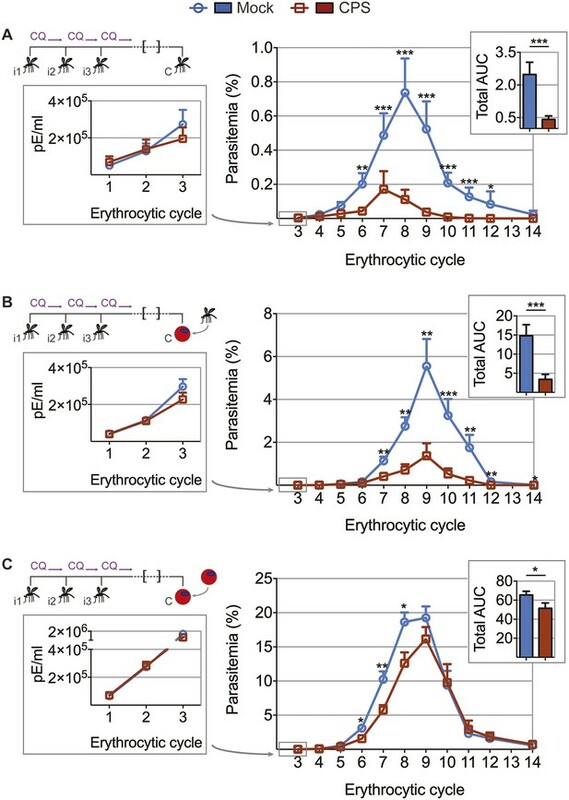 The number of pE (at the late trophozoite stage) was quantified immediately before merozoite egress from the liver, at 48 hr post mosquito transmission (erythrocytic cycle 0), and then every 24 hr until erythrocytic replication cycle 4. Daily parasitemia of 10 CPS immunized mice (each color represents an individual mouse) are shown. Blood-stage parasites were detected within the first erythrocytic cycle after every immunization in all but one mouse after the final immunization. 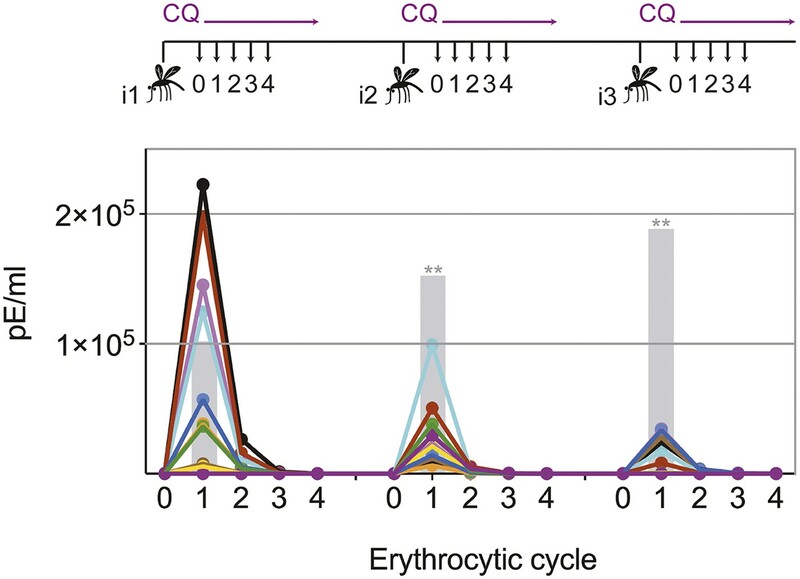 Gray bars represent the mean parasitemia in the first erythrocytic cycle of naive mice infected as controls for mosquito transmission efficiency separate with each immunization (n = 3–5). Significant differences in the number of blood-stage parasites in the first erythrocytic cycle between naive and CPS immunized mice are indicated (Mann Whitney test, **p ≤ 0.01). 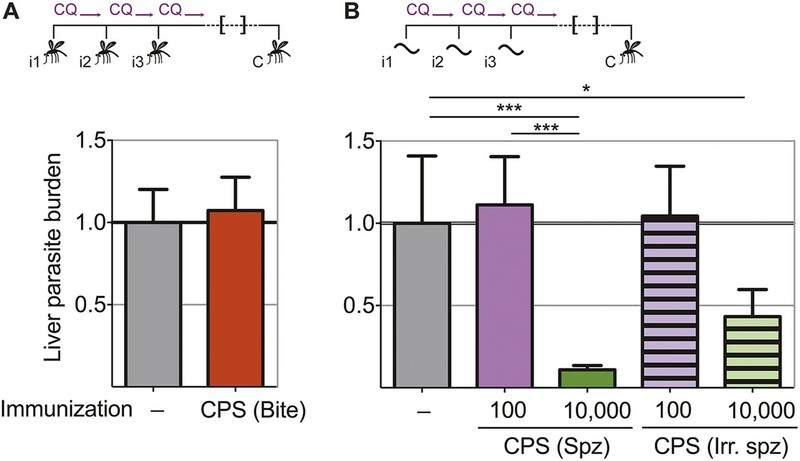 In order to assess directly whether pre-erythrocytic immunity was generated by this CPS immunization protocol, liver parasite burden was analyzed after mosquito bite challenge. Surprisingly, there was no difference in the liver parasite burden between mice given three CPS immunizations with P. chabaudi AS-infected mosquito bites and infection controls (Figure 3A). Therefore, immunization by mosquito bite under chloroquine cover according to this protocol failed to elicit pre-erythrocytic immunity. This is in contrast to results from other animal models of CPS immunization where pre-erythrocytic immunity is induced after high numbers of sporozoites are injected iv (Belnoue et al., 2004; Friesen and Matuschewski, 2011; Inoue et al., 2012; Nganou-Makamdop et al., 2012b; Lewis et al., 2014; Peng et al., 2014). To test if pre-erythrocytic immunity can be induced after CPS immunization with large numbers of sporozoites, we used P. chabaudi CB, since mosquitoes infected with this parasite strain harbor an increased number of sporozoites in their salivary glands compared to P. chabaudi AS (Spence et al., 2012), making these experiments technically feasible. In agreement with previous studies (Belnoue et al., 2004; Friesen and Matuschewski, 2011; Inoue et al., 2012; Nganou-Makamdop et al., 2012b; Lewis et al., 2014; Peng et al., 2014), mice immunized iv three times with 10,000 P. chabaudi CB sporozoites under chloroquine cover did show reduced liver parasite burden (up to 90%) after mosquito bite challenge, compared to infection controls (Figure 3B). Conversely, mice immunized iv three times with a low dose of 100 P. chabaudi CB sporozoites (representative of the estimated number of P. chabaudi sporozoites that initiate infection via mosquito bite, Spence et al., 2012) do not acquire pre-erythrocytic immunity (Figure 3B). It also appears that CPS immunization with 10,000 live sporozoites was more effective at inducing pre-erythrocytic immunity than immunization with 10,000 irradiated P. chabaudi CB sporozoites, which arrest during hepatic development (Suhrbier et al., 1990) and do not establish a blood-stage infection (Figure 3B). This suggests that complete liver-stage maturation and the increased blood-stage parasitemia that accompanies immunization with 10,000 sporozoites (as compared to 100 sporozoites or mosquito bite) could contribute to pre-erythrocytic protection. Pre-erythrocytic immunity following CPS immunization requires high doses of sporozoites. Liver parasite burden was determined 42 hr after mosquito bite challenge as copy number of P. chabaudi-specific 18S rRNA. (A) Mice were CPS immunized three times (i1, i2, i3) with P. chabaudi AS-infected mosquito bites under chloroquine (CQ) cover (CPS (Bite)) and challenged (C) 96–104 days after immunization by bites of P. chabaudi AS-infected mosquitoes (pooled data from three independent experiments; naive infection controls (−) n = 25, CPS (Bite) n = 35). (B) 100 or 10,000 untreated or irradiated (Irr.) P. chabaudi CB sporozoites (spz) were injected iv three times under CQ cover. Mice were challenged 96 days after immunization by bites of P. chabaudi CB-infected mosquitoes (naive infection controls (−) n = 12, all other groups n = 20). All data are displayed relative to the mean of corresponding liver parasite burden of naïve infection controls and presented as mean ± SEM, (A) Mann–Whitney test: no significant difference between the groups; (B) Kruskal Wallis with Dunn's multiple comparisons test *p ≤ 0.05, ***p ≤ 0.001. To test whether the transient blood-stage infection resulting from CPS immunization by mosquito bite (Figure 2) is sufficient to induce protection against erythrocytic parasites, we challenged mice approximately 100 days after the last immunization and measured blood-stage parasitemia (Figure 4). 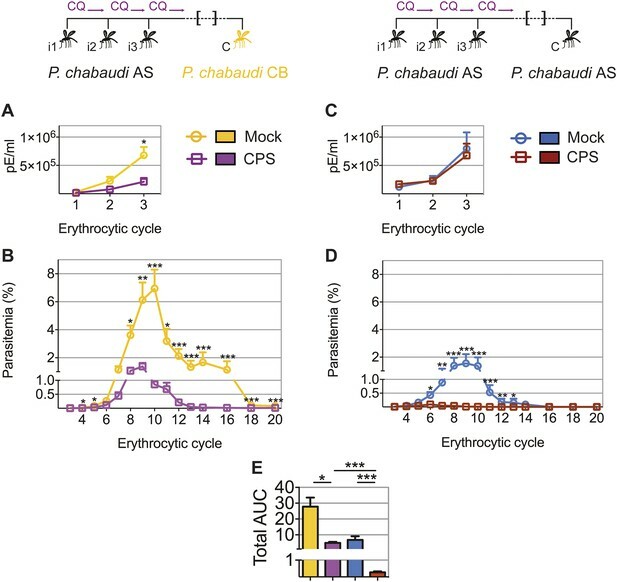 Mice that were CPS immunized with P. chabaudi AS had similar numbers of parasitized erythrocytes as compared to mock immunized controls within the first five erythrocytic cycles following mosquito bite challenge (Figure 4A). However, from erythrocytic cycle 6 parasitemia was significantly reduced and blood-stage parasites were cleared more rapidly in immunized mice. This was reflected in a 6-fold reduction of total area under the curve (AUC) (right inset, Figure 4A). Protection against erythrocytic parasites was also evaluated by direct blood challenge, using blood-stage parasites obtained from a donor mouse infected by mosquito bite. Similar to the results of mosquito bite challenge, blood-stage parasitemia was significantly reduced (Figure 4B), but the infection was still chronic in some mice (Figure 4—figure supplement 1). However, blood-stage protection was abrogated when CPS immunized mice were challenged with serially blood passaged (SBP) P. chabaudi; blood-stage parasites with increased virulence following multiple passages through naive mice (Spence et al., 2013, Figure 4C). In this case, CPS immunization reduced blood-stage parasite burden only between erythrocytic cycle 6 and 8, as compared to mock immunized controls. This was reflected in only a 1.2-fold reduction in total AUC (right inset, Figure 4C). Therefore, CPS immunization by mosquito bite elicits homologous blood-stage immunity, which is most effective in the context of mosquito transmission. CPS immunization elicits blood-stage immunity. Mice were CPS immunized three times (i1, i2, i3) using chloroquine (CQ) and P. chabaudi AS-infected or uninfected mosquito bites (mock immunized). Approximately 100 days after the final CPS immunization, mice were challenged (C) with P. chabaudi AS. Erythrocytic parasitemia was evaluated daily by quantitative RealTime PCR (cycle 1–3, displayed as parasitized erythrocytes (pE) per ml whole blood; left) and from cycle 3–14 by thin blood-film (expressed as % parasitized erythrocytes [parasitemia] 0.01% parasitemia corresponds to 1,000,000 pE per ml; middle). The total area under the curve (AUC) was calculated for each mouse between erythrocytic cycle 3 and 14 (right). (A) Mosquito bite challenge: parasitemia from 1st to 3rd (n = 10) and between 3rd and 14th erythrocytic cycle (representative of three independent experiments, n = 12–19), total AUC between cycle 3 and 14 (n = 19). (B) Direct blood challenge using 10,000 erythrocytic parasites obtained from a donor mouse infected by mosquito bite; injected intraperitoneal (ip): parasitemia between 1st and 3rd (n = 10) and 3rd and 14th erythrocytic cycle (representative of three independent experiments, n = 10), total AUC between cycle 3 and 14 (n = 10). (C) Blood challenge using 10,000 serially blood passaged parasites; injected ip: parasitemia from 1st to 3rd (n = 10) and between 3rd and 14th erythrocytic cycle (representative of two independent experiments, n = 8–10), total AUC between cycle 3 and 14 (n = 10). All data are presented as mean ± SEM, Mann–Whitney test per time point *p ≤ 0.05, **p ≤ 0.01, ***p ≤ 0.001. CPS immunization has so far not been shown to induce protection against challenge with genetically distinct strains of Plasmodium; a situation that would be encountered in human malaria-endemic areas. The genetic diversity amongst strains of P. chabaudi (Mackinnon and Read, 1999; Otto et al., 2014) allows us to investigate heterologous immunity in this model of CPS immunization. Mice that were CPS immunized with P. chabaudi AS-infected mosquito bites had reduced peak parasitemia, and blood-stage parasites were cleared faster, when compared to mock immunized mice after homologous (P. chabaudi AS) and heterologous (P. chabaudi CB) mosquito bite challenge (Figure 5A–D). 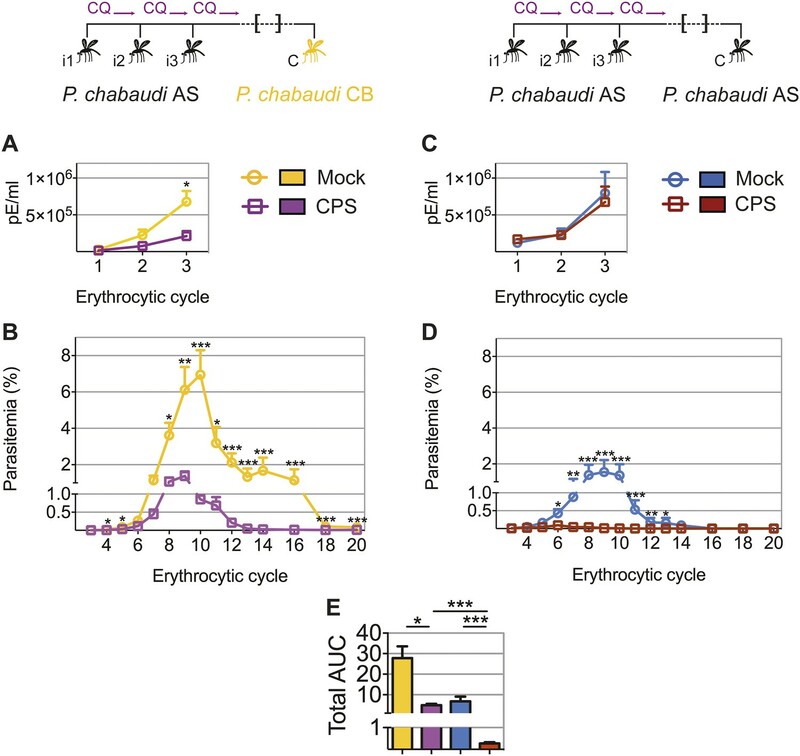 A direct comparison between P. chabaudi AS and CB challenge revealed nonetheless that homologous blood-stage immunity is more effective than heterologous immunity. In this experiment, CPS immunization reduced total AUC by 25-fold following homologous challenge, as compared to 6-fold following heterologous challenge (Figure 5E). Nevertheless, CPS immunization elicits blood-stage protection against a robust heterologous challenge with the genetically distinct, and more virulent, CB strain of P. chabaudi. CPS immunization elicits heterologous blood-stage immunity. Mice were CPS immunized three times (i1, i2, i3) under chloroquine (CQ) cover by P. chabaudi AS-infected mosquito bites or mock immunized with uninfected mosquito bites, and challenged (C) 96–107 days later by mosquito bite. Erythrocytic parasitemia was evaluated daily by quantitative RealTime PCR for blood-stage parasites (cycle 1–3, displayed as parasitized erythrocytes (pE) per ml whole blood) and from cycle 3–20 by thin blood-film (expressed as % parasitized erythrocytes [parasitemia], 0.01% parasitemia corresponds to 1,000,000 pE per ml). (A/B) Heterologous challenge with P. chabaudi CB infected mosquitoes (A) Parasitemia between 1st and 3rd (n = 10) and (B) from 3rd to 20th erythrocytic cycle (n = 20). (C/D) Homologous challenge with P. chabaudi AS-infected mosquitoes (C) Parasitemia between 1st and 3rd (n = 10) and (D) from 3rd to 20th erythrocytic cycle (CPS immunized n = 20, mock immunized n = 19). (E) Total AUC comparing mock and CPS immunized mice receiving heterologous or homologous mosquito bite challenge. Data are presented as mean ± SEM, (A–D) Mann–Whitney test per time point (E) Kruskal Wallis with Dunn's multiple comparisons test *p ≤ 0.05, **p ≤ 0.01, ***p ≤ 0.001. Blood-stage parasites appear to be both the source and target of protection following CPS immunization with P. chabaudi AS-infected mosquito bites. It was shown that immunization with serially blood passaged P. yoelii parasites with prophylactic chloroquine treatment can elicit pre-erythrocytic immunity (Belnoue et al., 2008). We wanted to assess whether blood-stage parasites have the potential to induce pre-erythrocytic protection also in the context of mosquito transmission. We therefore asked whether a fulminant blood-stage infection could elicit cross-stage immunity against pre-erythrocytic parasites. We infected mice with P. chabaudi AS by mosquito bite or intraperitoneal (ip) injection of recently mosquito transmitted blood-stage parasites. The two groups of mice were not drug-treated, and therefore experienced a low-grade chronic, recrudescing blood-stage infection for up to 90 days (Spence et al., 2013). 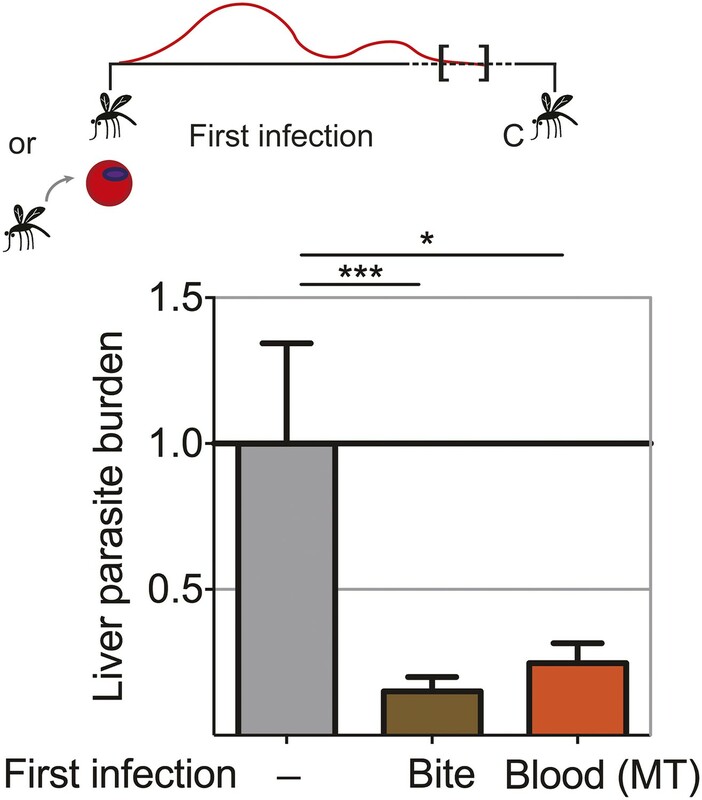 After mosquito bite challenge, both groups of mice demonstrated reduced liver parasite burden (up to 85%), compared to infection controls (Figure 6). Cross-stage immunity is therefore a powerful mechanism for protection against pre-erythrocytic parasites, which may be absent during CPS immunization with small sporozoite numbers as the blood-stage infection is curtailed by the use of chloroquine. Extended blood-stage parasitemia elicits pre-erythrocytic immunity. Mice received a first infection with P. chabaudi AS either by mosquito bite (Bite) or intraperitoneal (ip) injection of 10,000 parasitized erythrocytes obtained from a donor mouse infected by mosquito bite (Blood (MT)). Blood-stage parasitemia was self-cured before challenge (C; 98 days post-infection) using P. chabaudi AS-infected mosquito bites. 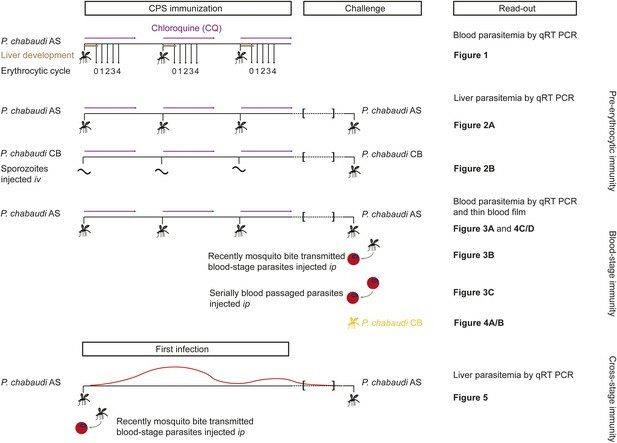 Liver parasite burden was determined 42 hr after mosquito bite challenge as copy number of P. chabaudi-specific 18S rRNA. Data are displayed relative to the mean of corresponding liver parasite burden of naive infection controls (−). Pooled data from two independent experiments (Naive (−) and Bite n = 30, Blood (MT) n = 20) are presented as mean ± SEM, Kruskal Wallis with Dunn's multiple comparisons test *p ≤ 0.05, ***p ≤ 0.001. Timing, route of infection, and antigen dose play major roles in determining the initial priming of the antimalarial immune response (Legorreta-Herrera et al., 2004; Elliott et al., 2005; Belnoue et al., 2008; Guilbride et al., 2012; Nganou-Makamdop et al., 2012a). We incorporated many of these aspects from human clinical trials (Roestenberg et al., 2009; Bijker et al., 2013, 2014) in a new P. chabaudi mouse model of CPS immunization to investigate the stage- and strain-specificity of CPS-induced protection against malaria. Our results highlight the complexity of immunity against the different life cycle stages of the malaria parasite (Table 1). Pre-erythrocytic immunity appears to depend on the number of immunizing sporozoites. In this study, we find no evidence of pre-erythrocytic immunity after CPS immunization with P. chabaudi infected mosquito bites, which inoculate an estimated maximum of 100 sporozoites per immunization (Spence et al., 2012, 2013). Sterile pre-erythrocytic protection was however reported in human CPS immunization trials (Roestenberg et al., 2009; Bijker et al., 2013, 2014). Anopheles stephensi mosquitoes experimentally infected with P. falciparum 3D7 or NF54 habor 50–200 times more sporozoites in their salivary glands (Bijker et al., 2013) compared to P. chabaudi AS (Spence et al., 2012). However, only few sporozoites are injected into the skin during mosquito bite and this number is independent of salivary gland sporozoites load (Beier et al., 1991; Ponnudurai et al., 1991; Medica and Sinnis, 2005). Since the number of sporozoites establishing a liver-stage infection can further be influenced by inherent sporozoite infectivity (Khan and Vanderberg, 1991), our best estimate of immunizing sporozoite dose is the number of infected erythrocytes observed directly after egress from the liver. Assuming that 10,000 merozoites are released from one infected liver cell (White et al., 2014), we estimate approximately 400 infected hepatocytes (95% CI 137–1250) in human volunteers (Bijker et al., 2013) compared to 5 in P. chabaudi AS immunized mice (95% CI 1–31). Therefore, the number of infected hepatocytes after CPS immunization by mosquito bite in the P. chabaudi mouse model is approximately 100-fold lower than in CPS immunized humans. We show that this differences in infected hepatocyte numbers by a factor of 100 can be significant for the development of pre-erythrocytic immunity: three immunizations with 10,000 P. chabaudi sporozoites iv induce long-lasting protection against mosquito bite challenge, while three immunizations with 100 P. chabaudi sporozoites fail to do so. This is in general agreement with other rodent malaria studies using P. berghei (Beaudoin et al., 1977; Golenser et al., 1977; Orjih et al., 1982; Friesen and Matuschewski, 2011; Nganou-Makamdop et al., 2012b; Lewis et al., 2014) or P. yoelii (Belnoue et al., 2004; Inoue et al., 2012; Doll et al., 2014; Peng et al., 2014), in which sterile pre-erythrocytic immunity is observed after immunization with high sporozoite doses (typically 10,000–50,000 sporozoites per immunization), while a reduction in sporozoite dose or the number of immunizations leads to breakthrough blood-stage infections upon challenge (Belnoue et al., 2004; Inoue et al., 2012). Reduction of the number of P. falciparum-infected mosquitoes also reduces the frequency of sterilely protected volunteers (Bijker et al., 2014), indicating that the number of sporozoites establishing a liver-stage infection fails to surpass the protective threshold to elicit sterile pre-erythrocytic immunity. This may also explain why in malaria-endemic areas pre-erythrocytic immunity is thought to be absent (Tran et al., 2013). In addition to maximizing specific responses against immunodominant antigens, CPS immunization with high numbers of sporozoites may broaden the immune repertoire by including protective responses against subdominant antigens, which could enhance heterologous pre-erythrocytic protection (Trieu et al., 2011). This may further be enhanced by the longer liver-stage development of P. falciparum (egress 6.8 days after mosquito bite, Roestenberg et al., 2012) compared to P. chabaudi (egress after 52 hr, Stephens et al., 2012). Longer liver stage development may positively influence the generation of pre-erythrocytic immunity by allowing time for protective immune responses to develop. Relationship between the dose of immunizing pre-erythrocytic and blood-stage parasites and the acquisition of immunity. A key feature of CPS immunization is that it permits exposure to all Plasmodium life cycle stages in the vertebrate host, including parasitized erythrocytes. It is well known that repeated exposure to blood-stage parasites, for example, in rodent models (Jarra and Brown, 1985; Legorreta-Herrera et al., 2004; Elliott et al., 2005), in humans exposed to ultra-low doses of parasitized erythrocytes while receiving drug treatment (Pombo et al., 2002), during malaria-therapy of neurosyphilis patients (Collins and Jeffery, 1999), and in people living in malaria-endemic areas (Bull et al., 1998), induces blood-stage immunity. Our results also clearly show that during CPS immunization repeated transient blood-stage infection (less than 0.01% parasitemia for 48–72 hr) elicits long-lasting blood-stage immunity. Protection against challenge infection was only apparent after multiple erythrocytic replication cycles and patent blood-stage parasite densities, which could indicate that blood-stage protection was not observed in CPS immunized human volunteers after direct blood-challenge because drug treatment is required at low parasite densities as soon as patency is reached (typically between the third and fourth erythrocytic cycle, Bijker et al., 2013). Blood-stage parasites are however recognized in human volunteers, which was demonstrated by an earlier increase of IFNγ and monokines induced by IFNγ (MIG) concentrations in CPS immunized volunteers compared to infection controls after direct blood challenge (Bijker et al., 2013). It will be of value to investigate whether the observed blood-stage protection in this mouse model is also detected in CPS immunized primates, where a longer blood-stage infection than that allowed in human clinical trials is possible. Despite the reduced peak parasitemia and faster clearance of blood-stage parasites during the acute phase of infection in CPS immunized mice, recrudescent parasitemia could still be observed in the chronic phase of infection after challenge, suggesting a parasite variant escapes the protective immune response (McLean et al., 1982). There are very few reports on protective efficacy of CPS immunization (or indeed any sporozoite-based vaccine) against direct blood-challenge (Belnoue et al., 2004; Inoue et al., 2012; Peng et al., 2014). Doll et al. (2014) reported that sustained, subpatent blood-stage infection after treatment with a commonly used dose of chloroquine can induce partial blood-stage protection. Low-grade transient blood-stage parasitemia, achieved by attenuation of blood-stage parasites using an antimalarial drug (Pombo et al., 2002; Elliott et al., 2005), a DNA alkylating agent (Good et al., 2013) or genetic tools (Ting et al., 2008; Aly et al., 2010) similarly provides protection against homologous and heterologous blood-stage challenge. We could show that CPS-induced blood-stage immunity is effective against heterologous mosquito bite challenge with a more virulent and genetically distinct strain of P. chabaudi (Mackinnon and Read, 1999; Lamb and Langhorne, 2008). In agreement with the observed cross-species protection after CPS immunization with mefloquine (Inoue et al., 2012), and one study using chemically attenuated sporozoites for immunization (Purcell et al., 2008), heterologous protection is less effective than homologous immunity. Nevertheless, CPS immunization can elicit long-lived protection against both homologous and heterologous blood-stage parasites, which will be important to minimize disease severity in the case of breakthrough blood-stage infections. This is essential for the development of an effective multi-stage malaria vaccine (Ellis et al., 2010; Bejon et al., 2011). In stark contrast to the observed heterologous blood-stage protection after mosquito bite challenge infection, protection was almost completely abrogated following direct blood-challenge with virulent parasites obtained after continuous serial blood passage. This suggests that blood-stage parasites immediately after mosquito transmission express antigens not present on serially blood passaged parasites and that these antigens may be the target of protective immunity following CPS immunization. Serially blood passaged parasites can hence escape from CPS-induced blood-stage immunity. One group of Plasmodium genes, whose expression is altered by mosquito transmission during blood-stage infection is the Plasmodium interspersed repeat gene family (pir); termed cir in P. chabaudi (Lawton et al., 2012). Transcription of more than half of all cir genes is increased in blood-stage parasites after mosquito transmission compared with their transcription after serial blood passage. This diversification of cir transcription is associated with a more effective host immune response, which in turn attenuates parasite virulence (Spence et al., 2013). The cir genes could also be candidate targets for cross-stage immunity, as P. berghei pir genes are also transcribed during the liver stages (personal communication BM Franke-Fayard and CJ Janse, Leiden University Medical Center, The Netherlands). An investigation into shared PIR proteins between liver and blood-stage parasites may hence provide valuable information for multi-stage malaria vaccine development. Furthermore, the absence of blood-stage protection in previous CPS models may have been due to challenge with serially blood passaged rather then recently mosquito transmitted blood-stage parasites. It is therefore always essential to evaluate blood-stage immunity in the context of mosquito transmission. As shared antigenic targets between liver- and blood-stage parasites have been described (Tarun et al., 2008), the exciting possibility of cross-stage protection has been considered but only rarely assessed. Genetically modified fabb/f- sporozoites that arrest late in liver-stage development protect against iv challenge with 100 blood-stage parasites (Butler et al., 2011). On the other hand, a blood-stage infection with serially blood passaged P. yoelii, drug-treated with chloroquine after 4–5 days, reduces liver parasite load upon iv challenge with 35,000 sporozoites (Belnoue et al., 2008). In our model of CPS immunization by mosquito bite, it is likely that repeated transient blood-stage infection during immunization elicits the observed blood-stage protection, although we cannot yet exclude that responses acquired against pre-erythrocytic antigens, which are shared with blood-stage parasites (Tarun et al., 2008), contribute as well. Because of the low number of infected hepatocytes after CPS immunization with P. chabaudi-infected mosquito bites this seems however unlikely. Nevertheless, we demonstrate unequivocally that extended exposure to blood-stage parasites is an effective stimulator of pre-erythrocytic immunity. Exposure to blood-stage parasites during CPS immunization may thus significantly contribute to the observed pre-erythrocytic protection in human volunteers (Roestenberg et al., 2009; Bijker et al., 2013, 2014). Indeed, cross-stage immunity could be responsible for the unprecedented efficacy of CPS immunization compared to immunization with irradiated sporozoites (Clyde et al., 1973; Seder et al., 2013), which arrest early during liver-stage development and never establish a blood-stage infection. While extending exposure to replicating blood-stage parasites by delayed drug administration is not possible in humans, the incorporation of chemically (Good et al., 2013) or genetically (Ting et al., 2008; Aly et al., 2010) attenuated blood-stage parasites should be considered to further enhance the generation and maintenance of both pre-erythrocytic and blood-stage immunity. This makes CPS immunization a powerful tool for the development of an effective multi-stage malaria vaccine. Inbred C57BL/6 mice, originally obtained from Jackson Laboratories (Bar Harbor, USA), were bred under specific pathogen-free conditions at the MRC National Institute for Medical Research (NIMR) for over 30 years. All experiments were performed in accordance with UK Home Office regulations (PPL 80/2358) and approved by the ethical review panel at the MRC NIMR. Mice were housed under reverse light conditions (light 19.00–07.00, dark 07.00–19.00 GMT) at 20–22°C and 50% relative humidity, with continuous access to mouse breeder diet and water. Plasmodium chabaudi chabaudi (P. chabaudi) AS and CB were cloned at the University of Edinburgh and sent to the NIMR in 1978 and 1982, respectively. Both parasite lines were routinely serially blood-passaged (SBP) through mice between 26 and 32 times by ip injection of parasitized erythrocytes or mosquito transmitted according to a recently published protocol (Spence et al., 2012). In brief C57BL/6 mice were injected ip with 100,000 parasitized erythrocytes and 14 days post infection gametocytemia was assessed on Giemsa-stained (VWR, Lutterworth, UK) thin blood film. A. stephensi mosquitoes, pre-treated with 50 μg/ml gentamicin (Sigma, Gillingham, UK) and starved for 24 hr before transmission, were fed on anaesthetised mice with >0.1% gametocytes of total erythrocytes at a ratio of >1 mouse per 100 mosquitoes. Mosquitoes were kept at 26.0°C (± 0.5°C) in an ultrasonic humidity cabinet and provided with 8% Fructose and 0.05% 4-Aminobenzoic acid (both Sigma, Gillingham, UK) feeding solution. After 8 days, a sample of 20 mosquitoes were dissected to assess development of P. chabaudi oocyts in the midgut. For infection of experimental mice 20–23 mosquitoes were transferred into 25 cl paper cups after 14 days, starved for 24 hr and fed on anaesthetized mice for 20–25 min at room temperature. Typically, mice were exposed to 9.15 (median, range 6.9–13.6) P. chabaudi-infected mosquito bites (Spence et al., 2012). Sporozoites were isolated from P. chabaudi-infected mosquito salivary glands 15 or 16 days post gametocyte feed. Salivary glands were dissected under a stereomicroscope, transferred to a glass homogenizer and kept in RPMI supplemented with 0.2% Glucose, 0.2% Sodium bicarbonate (both Sigma, Gillingham, UK), 2 mM L-Glutamine (Gibco, Paisley, UK) and 10% fetal bovine serum (GE Healthcare Life Sciences, Pittsburgh, Pennsylvania), on ice for maximum 2 hr. Sporozoites were released from the glands by gentle homogenization and washed three times before enumeration. The number of sporozoites per infected mosquito was enumerated for each mosquito transmission experiment. For iv injection P. chabaudi CB sporozoites were used, since mosquitoes infected with this parasite strain harbor an increased number of sporozoites per infected mosquito in their salivary glands (median 1638, range 175–2576) compared to P. chabaudi AS (median 438, range 43–956) (Spence et al., 2012). To arrest parasite development in the early stages of liver development P. chabaudi CB infected A. stephensi were exposed to 16 Gray (=16,000 rad) (Nganou-Makamdop et al., 2012b) of Caesium-137 γ-irradiation 15 or 16 days post gametocyte feed just prior to sporozoite dissection. Female age-matched 8–10 week old C57BL/6 mice were infected three times in 2-week intervals with P. chabaudi: either by P. chabaudi AS-infected mosquito bites or iv injection of P. chabaudi CB sporozoites. Mice were treated after each immunization with 100 mg/kg chloroquine diphosphate salt (chloroquine, Sigma, Gillingham, UK) by gavage daily for 10 days, starting from the day of mosquito transmission. Mock immunized mice received uninfected mosquito bites and chloroquine treatment. 100 days after the last CPS immunization mice were challenged with P. chabaudi AS or P. chabaudi CB-infected mosquito bites, or via ip injection of 100,000 parasitized erythrocytes (direct blood-challenge) that were obtained from either a donor mouse infected by mosquito bite or after serial blood passage. Since each erythrocytic cycle of P. chabaudi is approximately 24 hr long (Stephens et al., 2012) development of blood-stage parasitemia was monitored daily by microscopy of Giemsa-stained thin blood films, from erythrocytic cycle 3 to 14 and every other day thereafter. The limit of detection was 0.01% parasitemia, which equals 1 parasitized red blood cell in 10,000 erythrocytes or 1,000,000 parasitized erythrocytes per ml of blood. Liver and blood-parasitemia was assessed by quantifying 18S rRNA using qRT PCR. 42 hr after mosquito bite challenge mice were terminally anaesthetized and immediately upon cessation of respiration their livers were perfused with 5 ml RNAse-free Phosphate buffered saline (PBS, Gibco, Paisley, UK). Using the Gentle MACS homogenizer (Miltenyi, Bisley, UK) the whole liver was homogenized in 4 ml Guanidinium thiocyanate (Sigma, Gillingham, UK) solution (Chomczynski and Sacchi, 2006), and 600 μl aliquots were stored at −80°C. To assess blood-parasite burden during CPS immunization and in the first erythrocytic cycles following bite challenge 10 μl of blood were isolated from the tip of the mouse-tail and after two washes in RNAse-free PBS stored at −80°C in 100 μl Guanidinium thiocyanate solution (Chomczynski and Sacchi, 2006). The first sample was taken either just before (erythrocytic cycle 0) or 20 hr after liver merozoite egress (erythrocytic cycle 1) and then every 24 hr for 4 days. Since P. chabaudi displays a synchronous infection (Stephens et al., 2012) all blood-stage parasites analyzed were therefore at the late trophozoite stage of development. RNA was extracted from liver- as well as blood-samples using the Guanidinium-thiocyanate-phenol-chlorophorm method (all Sigma, Gillingham, UK; Chomczynski and Sacchi, 2006). RNA was thereafter reverse transcribed by PCR (temperature profile: 25°C for 10 min, 42°C for 20 min, 98°C for 5 min) using 75U MuLV Reverse Transcriptase, 30U RNAse Inhibitor, and 2.5 μM Random Hexamer primers (all Applied Biosystems, Paisley, UK) per sample. The amount of 18S rRNA copies was quantified by Real-Time PCR using TaqMan Universal PCR Master Mix (Applied Biosystems, Paisley, UK), 300 ηM forward primer (5′-AAGCATTAAATAAAGCGAATACATCCTTAT-3′), 300 ηM reverse primer (5′-GGGAGTTTGGTTTTGACGTTTATGCG-3′), and 50 ηM probe ([6FAM]CAATTGGTTTACCTTTTGCTCTTT[TAM]). All reactions were performed in the ABI 7900 HT Real Time PCR machine (temperature profile: 50°C for 2 min, 95°C for 10 min, 40 cycles of 95°C for 15 s and 60°C for 1 min). The amount of parasite 18S rRNA in the liver was calculated based on a Standard curve of known copy numbers of 18S rRNA. For every experiment liver-parasite burden was normalized to the mean burden of controls infected in the same experiment. Blood-stage parasitemia was quantified based on a Standard curve of 10-fold dilutions of mosquito transmitted P. chabaudi AS late trophozoites prepared identically to the samples. Data were analyzed using GraphPad Prism v7. Unpaired data between two groups at a specific time point were analyzed by Mann–Whitney test (two-tailed, non-parametric). Differences between more than two groups were analyzed by non-parametric Kruskal–Wallis test with Dunn's multiple comparisons test. Significant differences are indicated by asterisks with *p ≤ 0.05, **p ≤ 0.01, ***p ≤ 0.001. The American Journal of Tropical Medicine and Hygiene 44:564–570. The Journal of Infectious Diseases 204:9–18. The Journal of Immunology 172:2487–2495. The Journal of Immunology 181:8552–8558. Proceedings of the National Academy of Sciences of USA 110:7862–7867. The Journal of Infectious Diseases 210:1605–1615. Cell Host & Microbe 9:451–462. The American Journal of the Medical Sciences 266:169–177. The American Journal of Tropical Medicine and Hygiene 61:20–35. Reviews of Infectious Diseases 6:S352–S355. Clinical and Experimental Immunology 29:43–51. The New England Journal of Medicine 370:1799–1808. The Journal of Clinical Investigation, 10.1172/JCI66634. Annals of Tropical Medicine and Parasitology 104:189–211. International Journal for Parasitology 42:859–870. Proceedings. Biological Sciences/The Royal Society 266:741–748. The Journal of Infectious Diseases 200:1509–1517. Transactions of the Royal Society of Tropical Medicine and Hygiene 76:57–61. The Journal of Immunology 193:1268–1277. Transactions of the Royal Society of Tropical Medicine and Hygiene 85:175–180. Transactions of the Royal Society of Tropical Medicine and Hygiene 60:626–632. The New England Journal of Medicine 361:468–477. Proceedings of the National Academy of Sciences of USA 105:305–310. Molecular & Cellular Proteomics 10:M111 007948. Thank you for sending your work entitled “Blood-stage immunity to Plasmodium chabaudi malaria following chemoprophylaxis and sporozoite immunization” for consideration at eLife. Your article has been favorably evaluated by Prabhat Jha (Senior editor) and 4 reviewers, one of whom is serving as a guest Reviewing editor. The following individuals responsible for the peer review of your submission have agreed to reveal their identity: Urszula Krzych (Reviewing editor) and Michael Good (peer reviewer). Two other reviewers remain anonymous. 1) The discordant results showing pre-erythrocytic stage protection in the CPS murine model system and CPS studies conducted in humans warrant a thorough discussion regarding these differences. As an example, immunizations of human subjects via mosquito bite with P. falciparum via under CPS coverage induces sterile pre-erythrocytic immunity (Bijker et al., 2013), which has not been observed in the mice without intravenous (iv) administration of very high doses of sporozoites. Is this related to the P. falciparum versus P. chabaudi sporozoite inoculum delivered by mosquito bite? Although the answer to the question as to why there is a difference between rodent and humans remains unanswered, omitting this discussion diminishes the importance of the study. a) Although noteworthy, extending blood-stage exposure to enhance CPS immunization efficacy does not appear to be a transferable strategy to humans (in the final part of the Discussion section). With a delayed drug administration to humans (as has been achieved here in mice, as refereed to in the Discussion) one would risk that humans would be displaying malaria symptoms. These issues need to be addressed and the limitations acknowledged. b) Protection against pre-erythrocytic parasites afforded by blood stage infection without chemoprophylactic drug treatment (Figure 6) argues against the relevance of the CPS immunization model which does not provide pre-erythrocytic immunity after immunization by mosquito bite and therefore questions the ultimate message of the manuscript. The authors may consider rewriting these aspects and broaden the Discussion. c) While these cross-stage protection experiments are of great interest and significance to the malaria field, the results shown in Figure 6 have been considered as “stand alone” results. Perhaps this aspect of the study could be extended and additional experiments testing for immunologic mechanisms included. This addition would improve the quality of the manuscript. 3) CPS treatment gives rise to heterologous blood stage immunity. It is not clear from this study whether this is due to cross-stage immunity, or due to the low grade blood parasitemia that follows CPS and which would be in keeping with previous studies showing that exposure to very low density blood infections can induce heterologous blood stage immunity. While blood stage immunity has not been shown in human studies with P. falciparum and CPS, it quite plausible that it does exist for P. falciparum as well but it is simply undetectable because of the need to treat volunteers soon after the appearance of blood stage parasites. Please expand this point in your Discussion. 4) The CPS immunization protocol in mice protects against blood-stage infection (including heterologous strain) only when the challenge is delivered by mosquito bite (and not serial blood passage). This suggests immunity is raised against variant antigens that are shared between the heterologous strains following mosquito bite delivery. Although the data show protection against these genetically distinct strains of P. chabaudi, the potential for immune escape suggested by these results warrants further discussion. a) In the Introduction, the authors state that CPS provides both heterologous and pre-erythrocytic immunity but later state that CPS “abrogate” pre-erythrocytic immunity (in the end of the Results section). b) A disunity in the message is that low dose CPS immunization by mosquito bite offers no pre-erythrocytic protection but some homologous or heterologous erythrocytic immunity; high dose sporozoite challenge iv. or no drug, “self-cured” mosquito bite or ip blood stage infection provide pre-erythrocytic immunity. 1) The discordant results showing pre-erythrocytic stage protection in the CPS murine model system and CPS studies conducted in humans warrant a thorough discussion regarding these differences. As an example, immunizations of human subjects via mosquito bite with P. falciparum via under CPS coverage induces sterile pre-erythrocytic immunity (Bijker, 2013), which has not been observed in the mice without iv administration of very high doses of sporozoites. Is this related to the P. falciparum versus P. chabaudi sporozoite inoculum delivered by mosquito bite? Although the answer to the question as to why there is a difference between rodent and humans remains unanswered, omitting this discussion diminishes the importance of the study. We carried out CPS immunization of C57BL/6 mice using P. chabaudi AS-infected Anopheles stephensi mosquito bites, similar to human volunteers exposed to P. falciparum 3D7 or NF54 infected A. stephensi bites (Roestenberg et al. 2009, Bijker et al. 2013, Bijker et al. 2014). This means that the exact number of sporozoites inoculated, and subsequently the number of infected hepatocytes remains unknown. P. chabaudi AS-infected mosquitoes harbor a median number of 438 (range 43-956) sporozoites in their salivary glands (Spence et al. 2012). These numbers are in the same order of magnitude as P. falciparum infection rates observed in wild mosquitoes (Pringle 1966, Beier et al. 1991, Sherwood et al. 1996), but 50 to 200 times lower than infection rates of experimentally infected A. stephensi used for human CPS immunizations (Bijker et al. 2013). However, injection of sporozoites during mosquito bite is a stochastic process and does not necessarily correlate with the salivary gland load of the mosquito (Beier et al. 1991, Ponnudurai et al. 1991, Medica et al. 2005). Typically few sporozoites (estimated between 1 and 100) are injected during one infectious bite (Beier et al. 1991). Based on the number of infected erythrocytes observed directly after release from the liver and assuming that 10,000 merozoites are released from a single infected liver cell (White et al. 2014), we estimate that approximately 5 hepatocytes (95% confidence interval (CI) 1-31) are infected with P. chabaudi AS, whereas in human CPS approximately 400 hepatocytes are infected after the first immunization (95% CI 137-1250, Bijker et al. 2013). This may also be influenced by the higher number of infectious mosquitoes (12 to 15, Roestenberg et al. 2009, Bijker et al. 2013, Bijker et al. 2014) in humans compared to a typical P. chabaudi mosquito transmission (Median 9.15 bites, Spence et al. 2012) and possibly low infectivity of P. chabaudi sporozoites in C57BL/6 mice, as described previously for P. berghei in BALB/c mice (Khan et al. 1991). Therefore, we estimate that the number of infected hepatocytes after CPS immunization with mosquito bites in the P. chabaudi mouse model is approximately 100-fold lower than in human CPS. We show that this differences in infected hepatocyte numbers by a factor of 100 can be significant for the development of pre-erythrocytic immunity: Three immunizations with 10,000 P. chabaudi sporozoites iv induces long lasting protection against mosquito bite challenge, while three immunizations with 100 P. chabaudi sporozoites fails to do so (Figure 3B). The greater number of infected hepatocytes may broaden protective pre-erythrocytic immune responses by including subdominant antigens (Trieu et al. 2011). This may further be enhanced by the longer liver-stage development of P. falciparum in human CPS (egress 6.8 days after mosquito bite, Roestenberg et al. 2012) compared to rodent malaria species (P. chabaudi egress after 52h, Stephens et al. 2012). A longer liver stage development may positively influence the generation of pre-erythrocytic immunity by allowing time for protective immune responses to develop. Thus the lower number of infected hepatocytes after P. chabaudi infection by mosquito bite and the shorter liver-stage development may result in a less efficient induction of protective immunity compared to CPS immunization with P. falciparum in humans. These considerations have been added to the Discussion. That blood-stage parasites can convey pre-erythrocytic immunity is an exciting possibility for the induction of protective immunity to malaria and should be explored further, including in non-human primates and ultimately in humans (as mentioned in the Discussion). Of course we did not mean to suggest extending exposure to replicating blood-stage parasites in human volunteers beyond patency on thick blood film, which would be associated with major clinical risks. Instead it may be worth considering genetically (Ting et al. 2008, Aly et al. 2010) or chemically-attenuated (Good et al. 2013) blood-stage parasites, which would ensure prolonged exposure to infected erythrocytes, while posing minimal risks for the volunteer. This ambiguity has now been rectified in the Abstract and in the Introduction. The Discussion was extended to incorporate these points. While CPS immunization using P. chabaudi AS infected mosquito bites does not induce protection against liver-stage parasites (Figure 3A), it was shown that sterile pre-erythrocytic protection can be acquired after CPS immunization of human volunteers with P. falciparum (Bijker et al. 2013). As discussed in comment #1 this is likely explained by longer liver-stage development and a 100-fold higher number of infected hepatocytes, which translate into exponentially more blood-stage parasites being released from the liver in human clinical trials. Here we demonstrate that exposure to a large amount of blood-stage parasites gives rise to robust pre-erythrocytic immunity (Figure 6). This suggests that pre-erythrocytic protection after CPS immunization of human volunteers may, at least in part, be mediated by exposure to blood-stage parasites during immunization under chloroquine cover. Cross-stage immunity could be responsible for the unprecedented efficacy of CPS immunization compared to immunization with irradiated sporozoites (Clyde et al. 1973, Seder et al. 2013), which arrest early during liver-stage development and never establish a blood-stage infection. Moreover using our novel P. chabaudi mouse model of CPS immunization we show that in addition to pre-erythrocytic protection after immunization with large numbers of sporozoites (Figure 3B) partial blood-stage immunity can be acquired (Figure 4), which cannot be investigated in human volunteers. Therefore, given exposure to sufficient numbers of sporozoites and blood-stage parasites, CPS immunization can elicit powerful pre-erythrocytic as well as blood-stage immunity (Table 1). CPS immunization is therefore an invaluable tool to explore the generation of antimalarial immunity against multiple parasite life cycle stages, which can empower multi-stage malaria vaccine development. The Discussion has been broadened to highlight these arguments. As pointed out in comment #2b our finding that exposure to blood-stage parasites can induce pre-erythrocytic immunity underpins the hypothesis that pre-erythrocytic immunity observed in humans after CPS immunization may be partly generated by exposure to blood-stage parasites during immunization. These results are therefore central for the scope of this paper. We are pleased that the reviewers also believe, as we do, that “cross-stage protection experiments are of great interest and significance for the malaria field”. A detailed investigation of immunological mechanisms is of course necessary; however, an in depth study of cross-stage immunity using a panel of knock-out mice and/or deletion of specific subsets of cells would be beyond the scope of this publication. Since we use mosquito transmission and rest the mice after primary infection for 100 days, one experiment to evaluate immunological memory responses will last for 5 months. To uncover the immunological mechanism comprehensively would therefore take at least one, more likely two years. The authors hope the reviewers and editors understand the need to leave this exciting study into the mechanisms of cross-stage immunity for future investigation. It is very likely that the observed homologous and heterologous blood-stage protection after CPS immunization with P. chabaudi AS infected mosquito bites (Figure 4 and 5) is due to transient blood-stage exposure during immunization, which persists for 3 to 4 days after each immunization (Figure 2). CPS immunized human volunteers experience a similar pattern of transient blood-stage parasitemia during the immunization procedure (Roestenberg et al. 2009, Bijker et al. 2013, Bijker et al. 2014). Furthermore the small number of infected hepatocytes after P. chabaudi AS mosquito transmission (see comment #1) is unlikely to induce cross-protective responses directed against blood-stage parasites (given that they do not even induce stage-specific responses). Low-level transient blood-stage exposure was shown previously in mice (Elliott et al. 2005, Ting et al. 2008, Aly et al. 2010, Good et al. 2013) and humans (Pombo et al. 2002) to induce long-lived blood-stage immunity. Here we show that a significant protective effect of CPS-induced blood-stage immunity is apparent after 6 to 7 erythrocytic replication cycles following challenge (Figure 4 and 5). It is plausible that this would similarly be true in CPS immunized humans, but cannot be detected because of the need to treat as soon as thick blood film detectable blood parasitemia is reached (typically between the third and fourth erythrocytic replication cycle after challenge, Bijker et al. 2013). One volunteer, classified as protected from mosquito bite challenge infection by the absence of a positive slide and no clinical symptoms, had 457 parasites per ml as determined by retrospective qRT PCR at 21 days post challenge just prior to presumptive drug treatment (Bijker et al. 2013). In addition to a profound reduction of liver-stage parasitemia and prolonged liver-stage development, blood-stage immunity may have contributed to this delay. Conversely this volunteer had over 1.3 million parasites in his blood stream (assuming 3l of blood), which may also mean that blood-stage immunity was not acquired. Because of the difficulties to evaluate partial blood-stage protection in human volunteers, animal models like the here presented novel P. chabaudi-C57BL/6 mouse model are particularly valuable. The Discussion relating to blood-stage immunity has been expanded. Figure 4A and 5 clearly show that CPS immunization with P. chabaudi AS infected mosquito bites can protect against mosquito bite challenge with the AS and the more virulent CB strain and importantly also against direct blood challenge with recently mosquito transmitted blood-stage parasites (Figure 4B). Conversely CPS-induced blood-stage immunity was almost overridden after direct blood challenge with 26-32 times serially blood-passaged parasites (Figure 4C). This suggests that protective immune responses target antigens expressed by mosquito transmitted blood-stage parasites but not by serially blood passaged parasites. Serially blood passaged parasites can hence escape from protective blood-stage immunity elicited by CPS immunization with mosquito bites. One group of Plasmodium genes, whose expression is altered by mosquito transmission during blood-stage infection is the Plasmodium interspersed repeat gene family (pir); termed cir in P. chabaudi (Lawton et al. 2012). While only very few cir genes are transcribed after serial blood-passage, transcription of more than half of all cir genes was increased after mosquito transmission (Spence et al. 2013). Furthermore P. berghei pir genes are transcribed not only in blood-stage parasites but also in ookinetes (Otto et al. 2014) and liver-stages (personal communication B.M. Franke-Fayard and C.J. Janse, Leiden University Medical Center, The Netherlands), making them potential candidates for the induction of cross-stage immune responses. An investigation into the shared PIR proteins expressed by liver- and blood-stage parasites may hence provide valuable information for multi-stage malaria vaccine development. Since serially blood passaged parasites can i) escape the protective immune response, ii) would never be encountered in an endemic setting, iii) elicit different immune responses, iv) transcribe different genes and thus v) display enhanced virulence compared to mosquito transmitted blood-stage parasites (Spence et al. 2013), we believe that it is essential to always evaluate blood-stage protection in the context of mosquito transmission. The Discussion has been extended to highlight the potential for immune escape and the role of the Plasmodium interspersed repeat gene family after challenge with serially blood passaged parasites. a) In the Introduction, the authors state that CPS provides both heterologous and pre-erythrocytic immunity, but later state that CPS “abrogate” pre-erythrocytic immunity (in the end of the Results section). Both references have been amended to avoid confusion. b) A disunity in the message is that low dose CPS immunization by mosquito bite offers no pre-erythrocytic protection but some homologous or heterologous erythrocytic immunity; high dose sporozoite challenge iv or no drug, “self-cured”mosquito bite or ip blood stage infection provide pre-erythrocytic immunity. We added Table 1 to clarify the effect of low and high antigen dose (the number of immunizing sporozoites and liver-stage parasites as well the amount of blood-stage parasites) for the acquired protection. What is perceived as a disunity of message reflects the complexity of immunity against the different life cycle stages of the malaria parasite (please see the Discussion). That immunity is not necessarily life cycle stage specific also needs to be taken into account. Our findings are comprehensively discussed and summarized in Table 1. We thank Sarah Keller McLaughlin for skilled technical assistance, and we are grateful for support from the Division of Biological Services, MRC NIMR. Anja Scholzen and Else M Bijker are acknowledged for critical reading of the manuscript. WN, PJS, IT, PL, WJ, and JL were supported by the UK Medical Research Council (U117584248). This study was also funded by the FP7 founded European Virtual Institute of Malaria Research (EVIMalaR, grant agreement number 242095) and the Wellcome Trust (UK). WN received an EVIMalaR PhD scholarship. PJS was the recipient of a Leverhulme Trust Early Career Fellowship. Animal experimentation: All experiments were performed in accordance with UK Home Office regulations (PPL 80/2358) and approved by the ethical review panel at the MRC National Institute for Medical Research. © 2015, Nahrendorf et al.